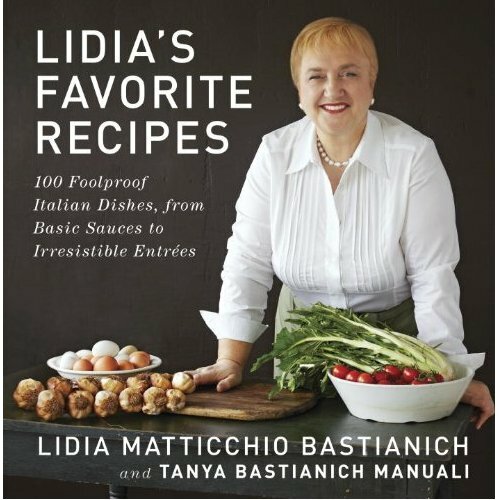 Today (Sunday, November 25th) is the last day to enter the cookbook giveaway for Lidia's Favorite Recipes. Simply comment on the previous post, and your name will be entered into the draw! 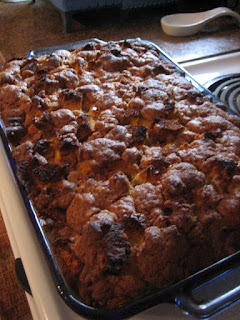 After making this recipe, I'm now totally on board with making french toast the night before. Not only do you save yourself time in the morning (which is helpful when you have guests over and a baby to look after), but it also tastes great. This french toast recipes comes from Two Peas and their Pod. It is almost like a hybrid between french toast and bread pudding. R's mom helped me out with preparing this recipe since Ms. E was having a meltdown while I was trying to put the dish together. 2. 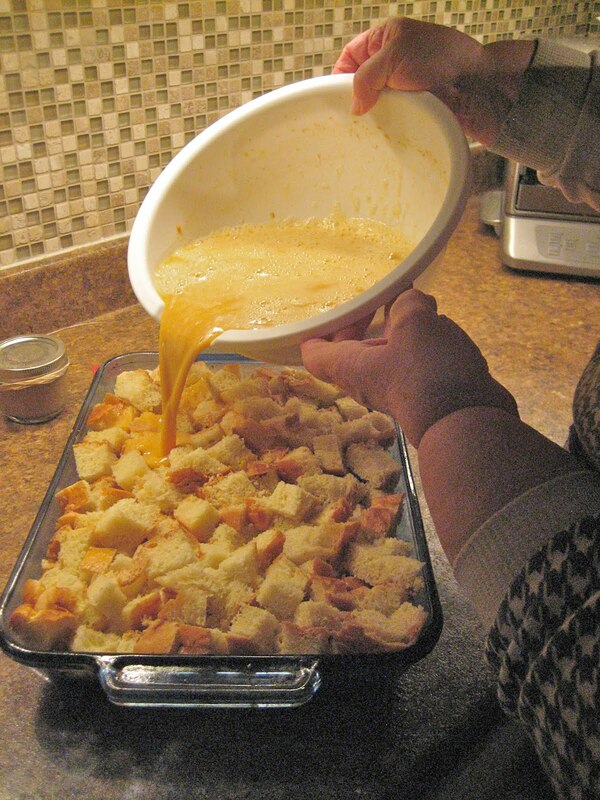 In a large bowl, mix together eggs, milk, pumpkin puree, sugar, vanilla extract, cinnamon, and nutmeg. Pour evenly over bread. 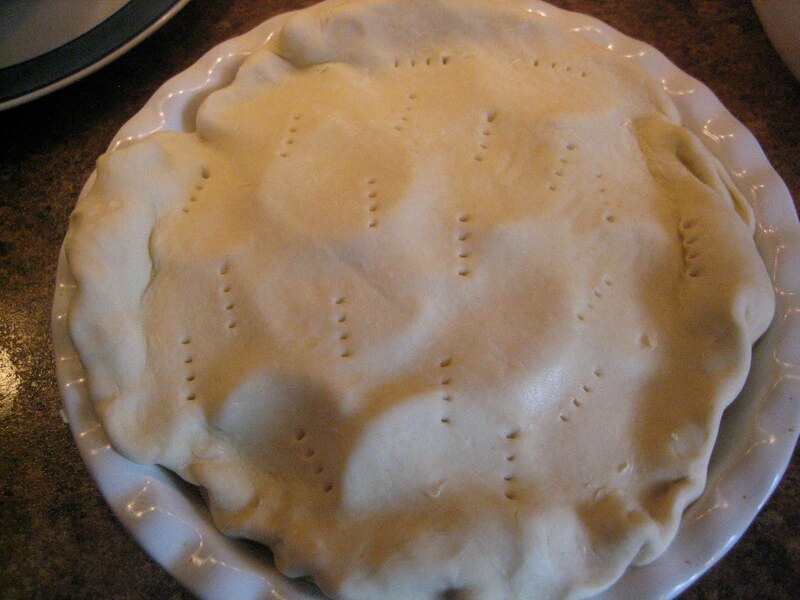 Cover pan with saran wrap and store in the refrigerator for several hours or overnight. 3. In a separate bowl, mix together flour, brown sugar, cinnamon, nutmeg, and salt. Add butter pieces and cut into the dry mixture using a fork or your hands. Combine until the mixture resembles sand with a few pea sized chunks. Cover and store mixture in the refrigerator. 4. 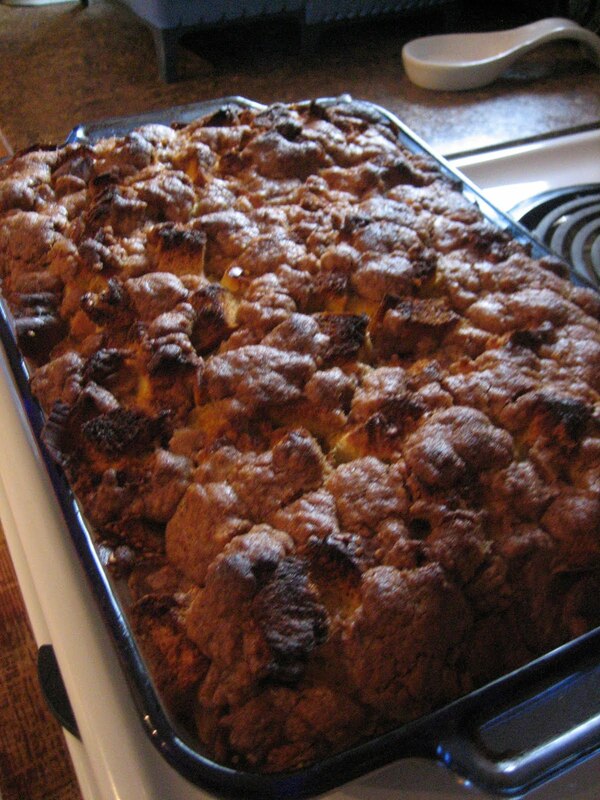 When you’re ready to bake the French toast, preheat oven to 350 degrees F. Remove French toast from refrigerator and sprinkle crumb mixture over the top. Bake for 45-55 minutes, or until the French toast is set and golden brown. 5. Serve warm with syrup, if desired. Verdict: Tasted delicious and smelled amazing too! In the future, I may try adapting the streusal recipe to include oatmeal. I didn't find it had much of a crumble coating effect. R and I bit the bullet and made the drive to Toronto. A five hour drive (longer with a baby) can be pretty daunting with a baby that has a bit of a sleep/hate relationship with her car seat. 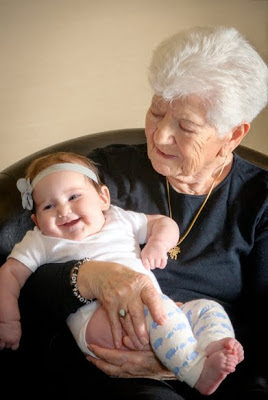 But, I really wanted to introduce Ms. E to my Baba (now known as: Super Baba) and get some pictures of the two of them together. As the title suggests, this cookbook contains a collection of Lidia's favorite and most accessible recipes. 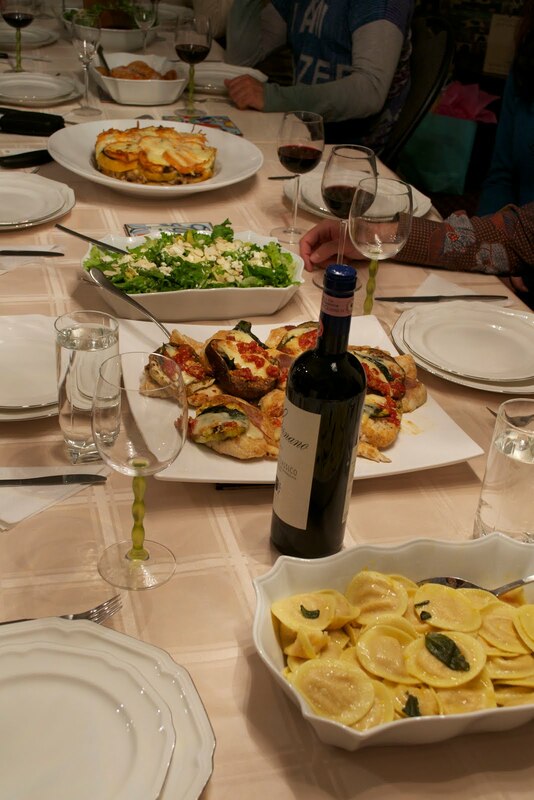 Also check out Lidia's website, which has lots of recipes. videos, and other content, here. Would you like a copy of this cookbook? One of our readers will receive a free copy of this cookbook. All you have to do is comment on this post before Sunday, November 25th 11:59pm (EST). This giveaway is open to readers in Canada and the United States only. 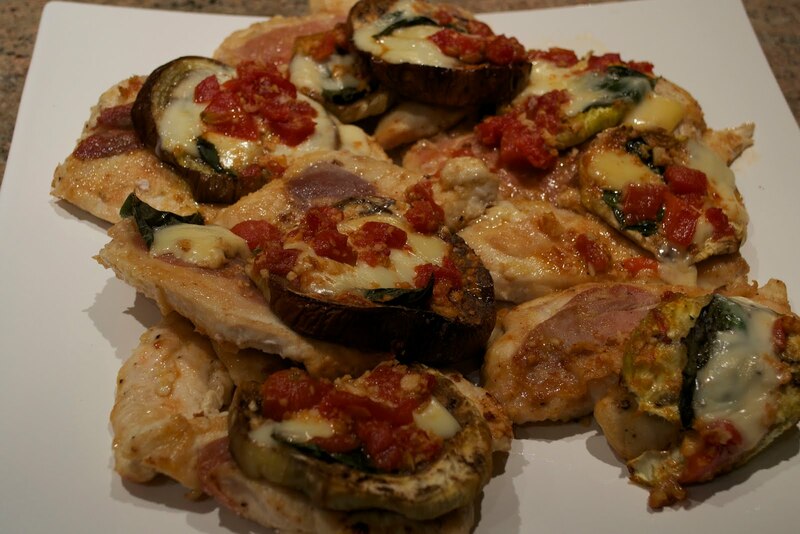 After tagging all of the recipes that I was interested in trying (a process the becomes futile when almost every page is tagged), I decided I wanted to make the Chicken Breast with Eggplant and Fontina Cheese. Trim the stem from the eggplant. 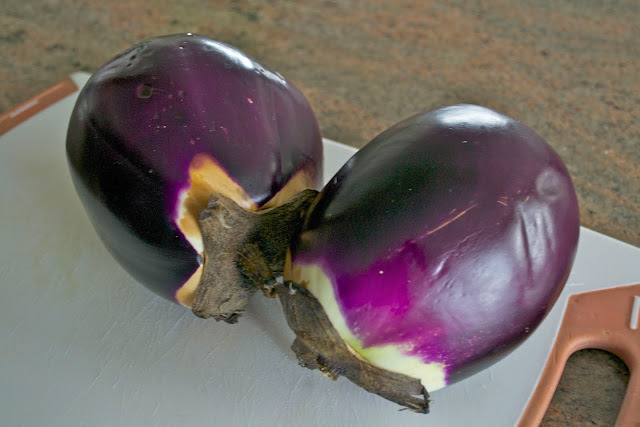 Remove the strips of peel about 1 inch wide, leaving about half the peel intact, and cut the eggplant into 1-inch crosswise slices. Sprinkle a baking sheet with salt, arrange the slices over the salt and sprinkle with more salt. Let them stand until both sides are wet, about 30 minutes. Rinse the eggplant under cool running water, drain thoroughly, and pat dry. 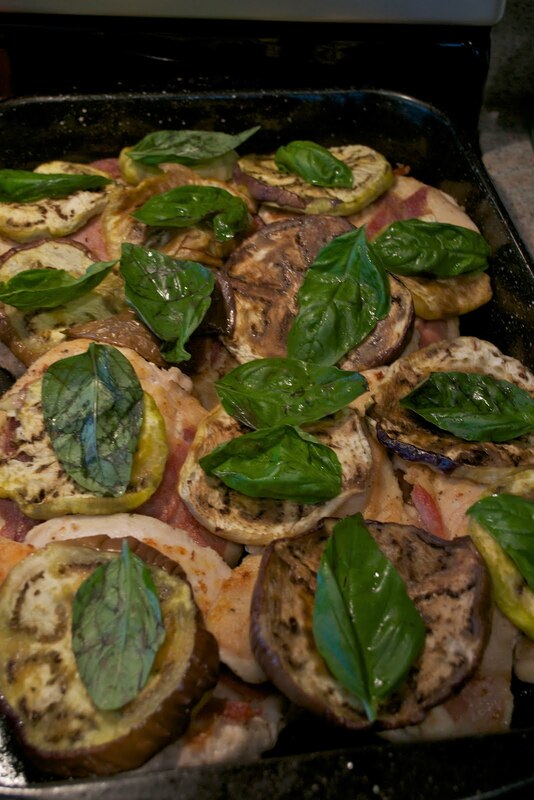 Preheat the oven to 400 degree F. Wipe the baking sheet clean, and oil it generously, using about half the oil. 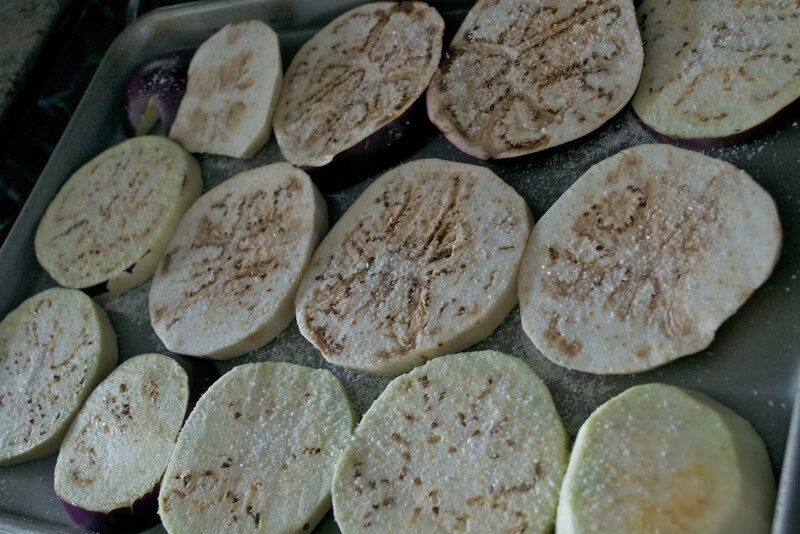 Arrange the eggplant on the baking sheet, and turn to coat the slices with oil. 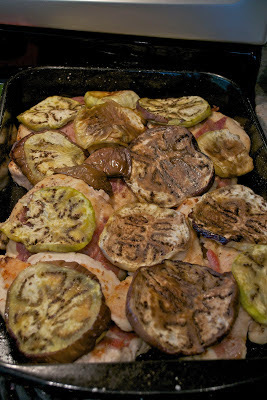 Roast until tender and well-brouned, turning them and rotating them in the pan as necessary, about 20 minutes. Remove and cool. 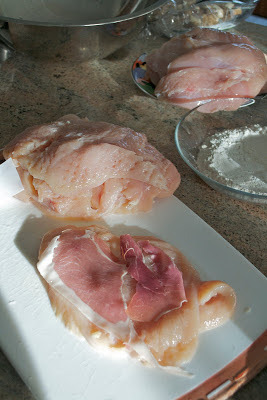 Increase the oven temperature to 450 degrees F.
Cut each chicken breast in half on a bias, and lightly pound it. Season the chicken very lightly with salt (We omitted) and pepper (the prosciutto will give the dish plenty of salt as is), and layer each piece of chicken with half a slice of the prosciutto tapping the prosciutto with the back of the knife so it adheres to the meat. Heat 2 tbsp of the remaining olive oil and 2 tbsp of the butter in a heavy, wide skilled over medium heat. Dredge the chicken in flour to coat both sides lightly, tapping off excess flour, and add as many to the skillet, prosciutto side down, as will fit without overlapping. Cook just until the prosciutto is light golden, about 2 minutes. 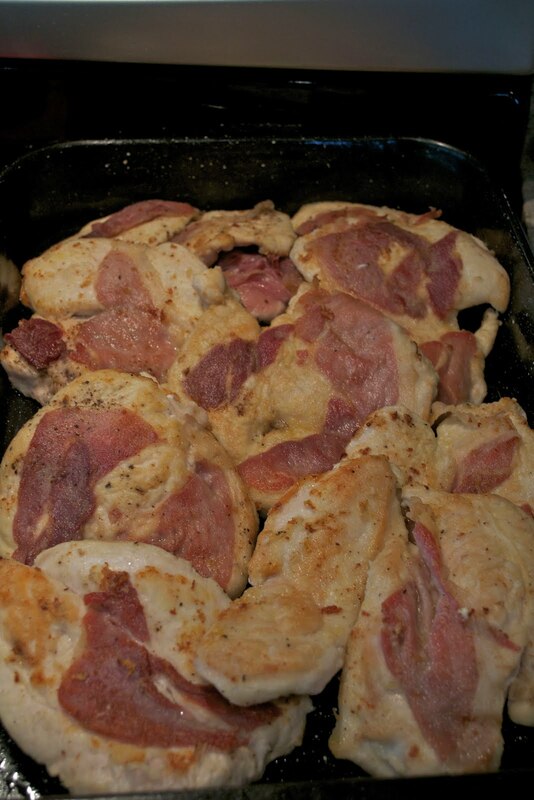 Turn and cook until the second side is browned, about 2 minutes. Remove, and drain on paper towels. Repeat with the remaining chicken, adding more oil if necessary. 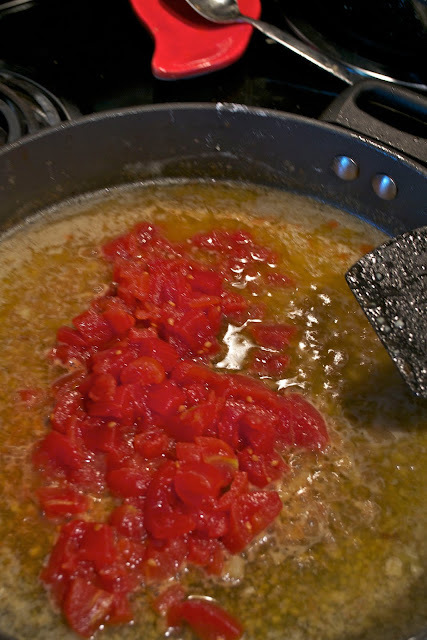 After removing the last piece of chicken from the skillet, pour in the remaining oil, and scatter the garlic in the skillet. Cook, turning, until golden brown, about 3 minutes (Lower the heat, if necessary, so the bits of flour that stick to the pan don't burn while the garlic is browning). 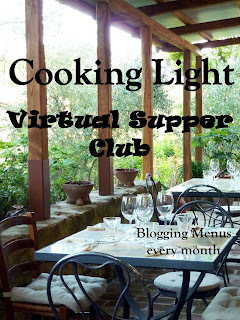 Pour the wine into the skillet, bring to a boil, and boil until it's almost completely evaporated. Pour in the stock, and drop in the remaining 3 tbsps of butter. Bring to a boil, stir in the chopped tomatoes, and boil until the sauce is lightly reduces and glossy about 4 minutes. 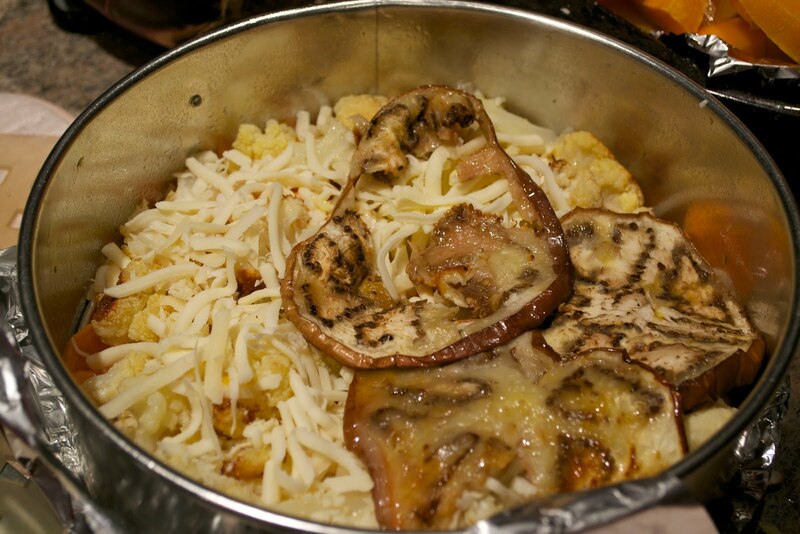 Meanwhile, arrange the scaloppine side by side in a baking dish. Cover them with the eggplant, coating or tearing the slices as necessary to cover all the scaloppine more or less evenly, and top each with a leaf of basil. 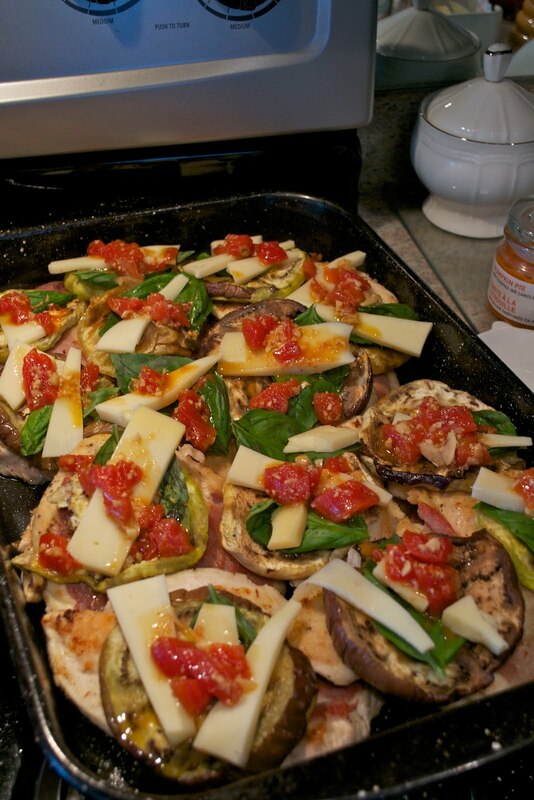 Dividing the Fontina slices evenly over the eggplant, doting the Fontina slices with a dab of tomato sauce. Pour the pan sauce around the chicken and bake until the cheese is melted and lightly browned in place and the sauce is lightly thickened, about 10 minutes. Transfer the bubbly chicken to serving plates, placing two on each (we didn't serve the chicken this way). Spoon the sauce -- through a strained if you like -- around the plates. Decorate the plates with additional basil leaves if desired. Verdict: Let me start by saying that this dish was so tasty! I think it was both Giz's and my favourite dish of the night! 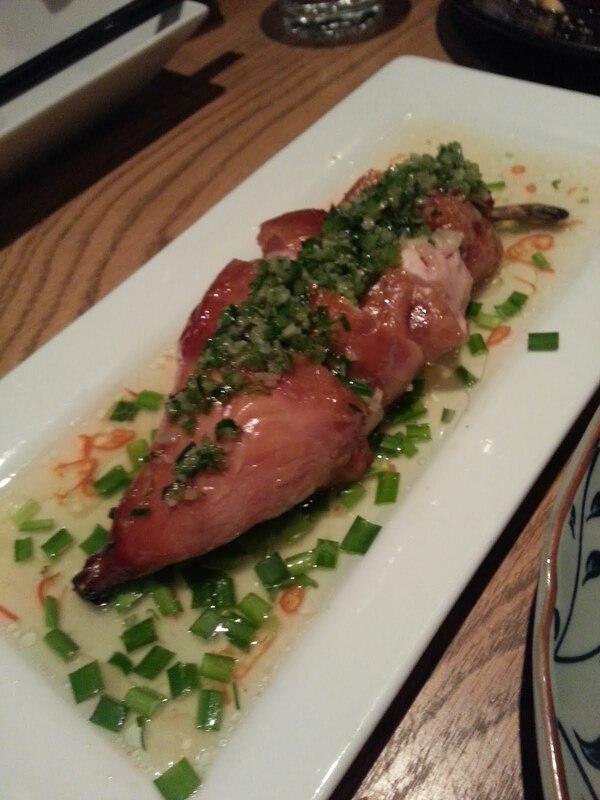 But I learned a lesson with this dish. I need to spend more time reading and visualizing the steps of an recipe before I start it. I tend to start things and believe that I'll just figure it out as I go. This approach can work, but when you've got a recipe with several components and steps, along with several other dishes on the go, it can be a bit chaotic. 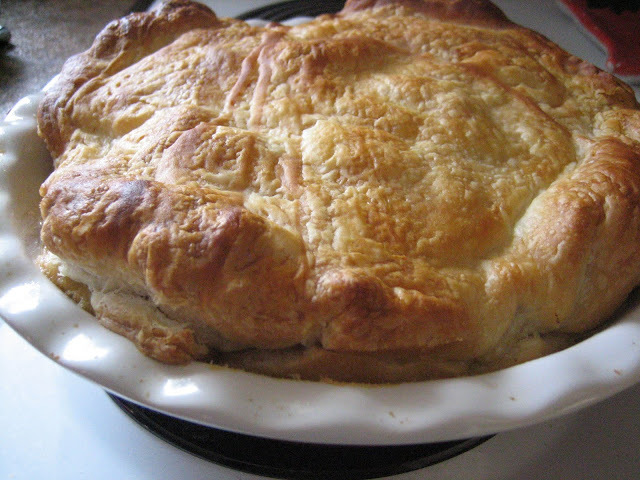 Having already made the recipe once, it'll be easier to make it again in the future. But, I found myself re-reading the recipe as I had my hands covered in ingredients and things burning on the stove. 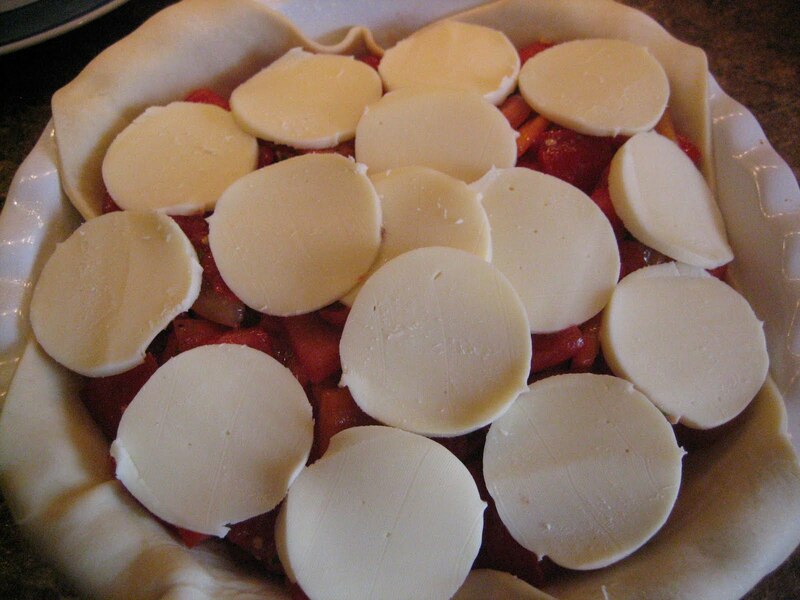 I also now know that you can pretty much complete the recipe to the point just before putting it in the oven (i.e., the part where you "bake until the cheese is melted and lightly browned in place and the sauce is lightly thickened, about 10 minutes"). You just want to be mindful of the chicken, which won't be fully cooked through yet if you've only cooked each side for two minutes. Some of the other recipes I'm looking forward to making include: Arancini di Riso (rice balls...but it sounds so much better in Italian), Minestrone Soup, Tagliatelle with Wild Mushroom Sauce, Ziti with Roasted Eggplant and Ricotta Cheese, and Marinated Winter Squash. Disclaimer: A free review copy of this cookbook was sent to me. Note: this post was written by Giz. Your reader may say that it was written by Psychgrad because she took and uploaded the pictures. We all know about arthritis. I remember, as a teenager hearing people talk about their "arthritis" while they were rubbing their joints and saying alot of "oy" and giving a knowing nod to one another as brothers and sisters understanding each other's pain. My thoughts then were: "what could be so bad and why so much drama about a little arthritis?" I'm grown up now and have a whole new outlook on the whole arthritis thing. Arthritis is really quite a general term for a family of approximately 100 different presentations and degrees of what is typically symptomized by joint paint. The most common - osteoarthritis - is something I share my life with and frankly the relationship is not so satisfying. When the opportunity presented itself for a complimentary copy of The Complete Arthritis Health, Diet Guide and Cookbook from Robert Rose Publishers , I jumped at it. I'd always heard the expression that the worst thing you can do is "nothing" so I've made a point of swimming daily. The pool seems to be the least painful way to exercise and after an hour of constant movement, you feel so much better. Seriously. 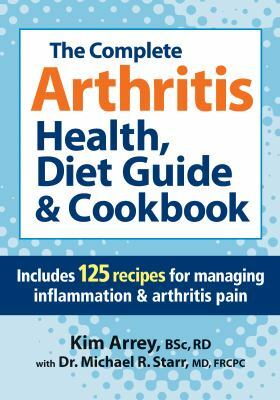 The book, written by dietician Kim Arrey and Dr. Michael R. Starr, is a clear look at what arthritis is, how it affects you while giving you 125 easy to follow recipes to help you change your narrative through a common sense diet. I've learned so much about the foods that both increase and decrease inflammation that the recipes, although wonderful, rank second to the learning of what works and what doesn't in terms of nutrition. Although making even small changes can be somewhat intimidating, the book suggests the little steps such as replacing white potatoes with sweet potatoes, incorporating more vegetables and legumes in your diet and joining an aquafit class at least a couple of times a week. I'll be using this book as a bible for feeling better, that's a for sure! If someone in your family is challenged with any form of arthritis, I encourage you to gift them this year with this gift of good health. Trust me, it'll be so appreciated. This past weekend Psychgrad, R and Ms. E came for a visit and we invited the family over for dinner to celebrate the welcoming of our precious Ms. E to the family. She's already wormed her way into the hearts of all of us and will go through her first year being the most photographed child in the history of our family. She's already showing signs of strong interest in technology and loves to look at pictures of herself. Is there such a thing as vanity at the age of 3 months? We incorporated some of what I've learned in The Complete Arthritis Health, Diet Guide and Cookbook in our menu planning. I decided to go with some interesting looking dishes that Marie of Proud Italian Cook. The first is a Vegetable Torta that's made up of any number of roasted vegetables that you may have on hand or chose specifically to use. 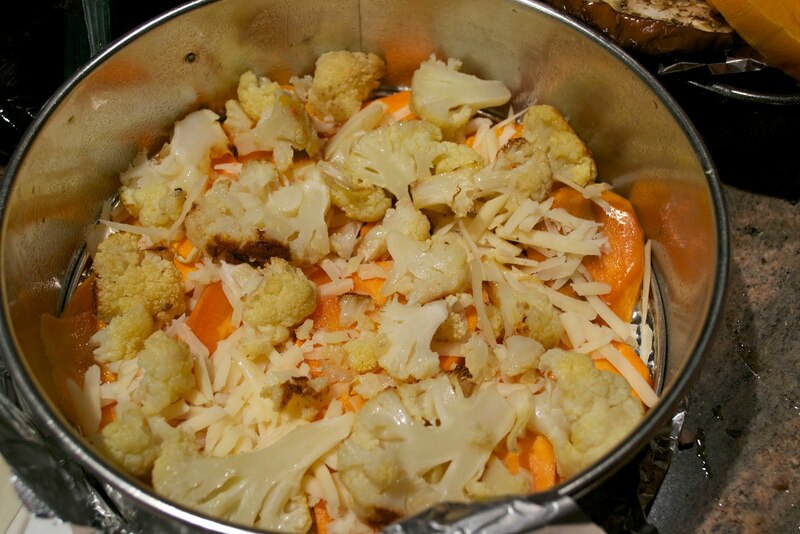 We cut up the following vegetables and roasted them in a 425 F oven tossed with olive oil and kosher salt. Cut the vegetables (round veg in rounds) After roasting the vegetables, let them cool. We used a 9 inch springform pan and began with a thin layer of sweet potatoes. Shred 4 oz of Asiago Cheese and 6 oz of Mozarella Cheese. The cheeses become the glue that holds it all together. Continue to layer and push firmly into place after each layer adding a small amount of asiago and mozarella. 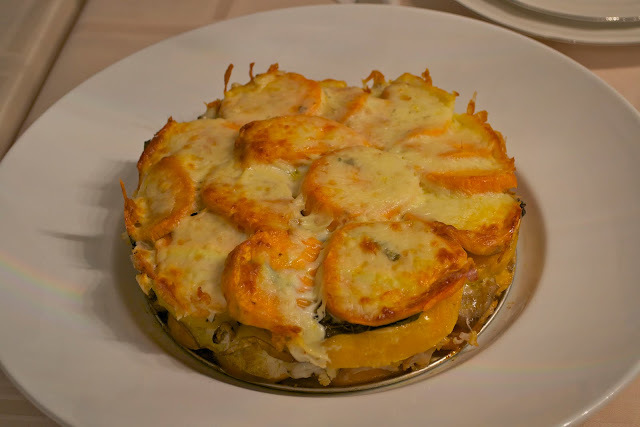 Top with sweet potatoes and finish with the cheeses. Cover your torta with aluminum foil and bake for 15 minutes; uncover and bake for another 20 minutes or until nicely golden. 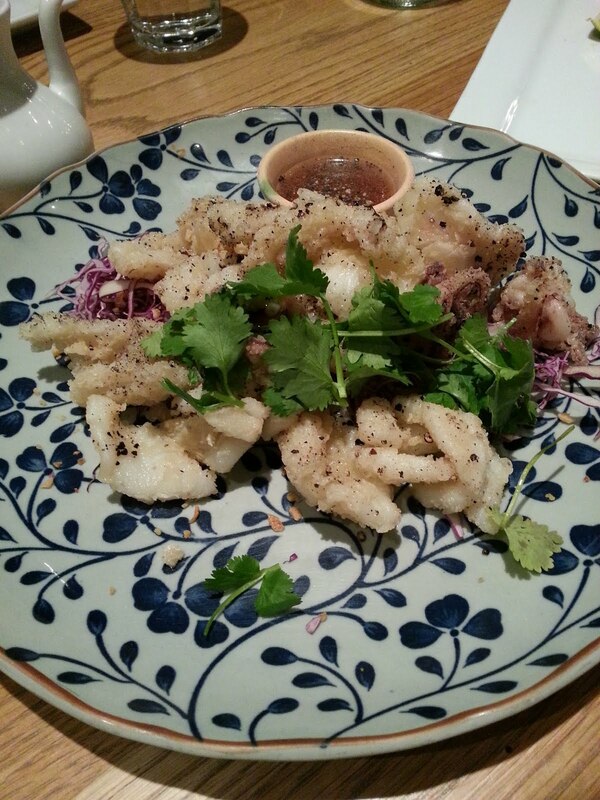 The second dish that is more of an adaptation is so simple and so delicious. We made a simple Greek dressing with 3 parts olive oil, 1 part red wine vinegar, 1 clove crushed garlic, oregano, 1 Tbsp dijon mustard and a splash of fresh lemon juice. 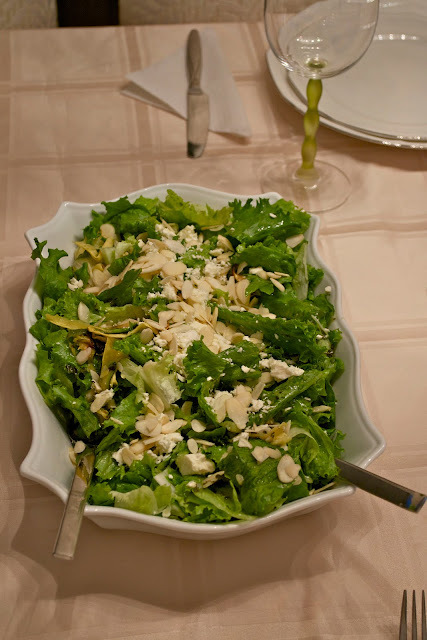 Add to the lettuce with feta and dress. 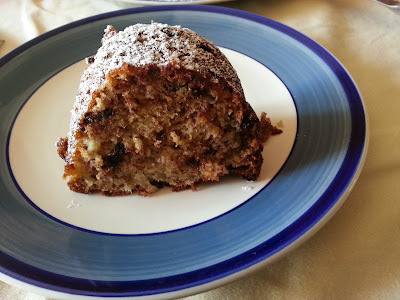 Top with almonds and voila - deeeelicious. Is it just me or does anyone else think about the movie "My Big Fat Greek Wedding" anytime bundt cakes come up? Maybe that's why I rarely make these "cakes with a hole in them." 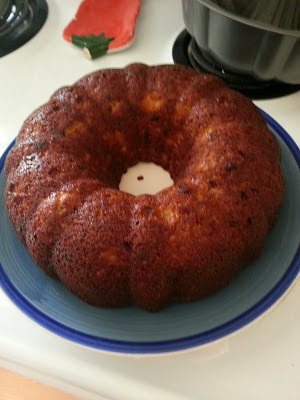 My friend refers to her side of the family as the Bundt cake side, relative to her in-laws, who are louder and a bit crazier. This is kind of how I feel about my family sometimes. My in-laws definitely have their idiosyncrasies. But in my family, confusion (and occasionally chaos) reigns, despite the fact that there is an excessive flow of information. Everyone is in everyone's business. But no one knows what is going on. 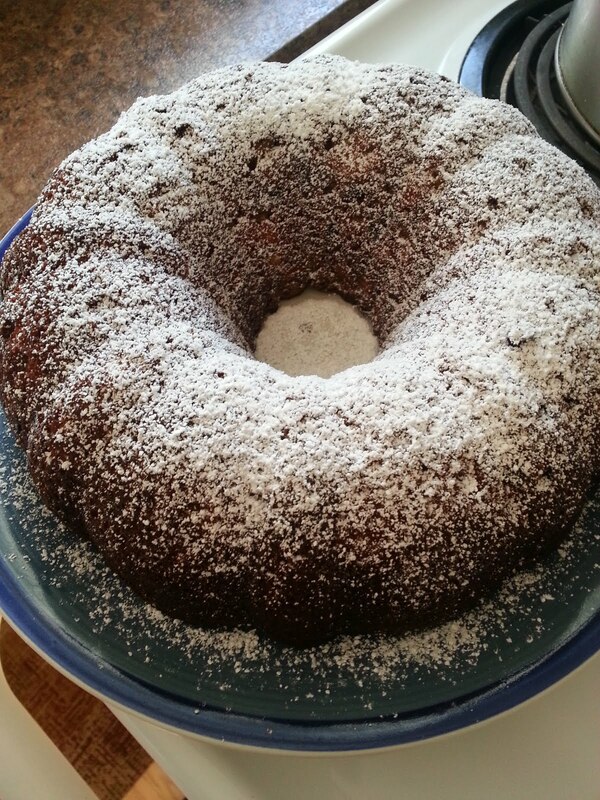 So, when R's parents made the trip to Ottawa to meet their new granddaughter, my mind kept going to making them a bundt cake. I still had a bunch of bananas, so I decided to make a banana chocolate chip bundt cake. In large mixing bowl cream butter and sugar together. Add eggs and beat until lighter in color. Set aside. Next, sift together flour, baking soda and baking powder and add nuts, set this aside also. Cream together milk, mashed banana, and vanilla. Add chocolate chips and stir in. Add creamed banana mix alternately with flour mix to your first mixture of butter, sugar and eggs. Scrape into greased, floured bundt pan. Bake 50 to 60 minutes at 350 degrees. Cool 10 minutes. Remove from pan. Sift a few tablespoons of powdered sugar onto cake top. Verdict: Tasted great -- particularly when warm. Ahhh Sweet November and it's peanut butter month in the hood. A versatile ingredient and a staple in a vegan diet (unless of course you have a nut allergy), peanut butter can be an appetizer, a main and/or a dessert. Somehow I gravitate to the dessert portion of the meal and this month is no different. 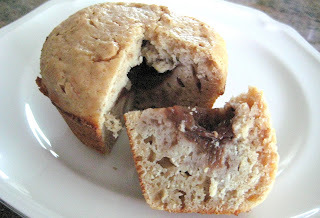 A lighter version of the peanut butter and jelly muffin was my pick this month and I discovered that this muffin was a choice that will most definitely make repeat performances in the Equal Opportunity Kitchen. All I can say is Yum Yum! Just over three years ago, I tried to hold an online intervention to help my mother-in-law, Giz, with her addiction to cooking. You can read about it here. She was obsessed with reading/watching/buying/cooking food. Sadly, the intervention failed miserably. Everytime I opened the fridge, I felt overwhelmed. It was hard to find something in the fridge without taking out ten other items. Plus, it was hard to fit everything back in afterwards. Also, I couldn’t believe Giz bought more tomatoes and cucumbers. We had a tonne of fresh ones from the garden! Anyway, after she left, I tried to use what I could, so that we wouldn’t have to jam everything into our compost bin. Since we had a tonne of tomatoes and a bunch of eggplants, I searched for a recipe with these items and found a great recipe for a quiche. The recipe didn’t include roasted red peppers, but I added them, since we had a giant jar in the fridge. 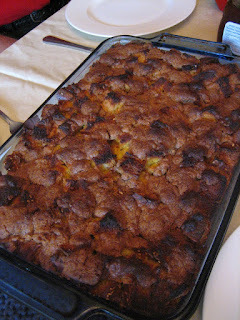 The silver lining in this whole ordeal is that I found a great recipe that I plan on making again. It’s a keeper. Wash, dry and cut eggplants into small cubes. Put in a bowl, sprinkle with salt and let rest for 1 hour about. Drain, dry and fry in hot oil stirring occasionally. 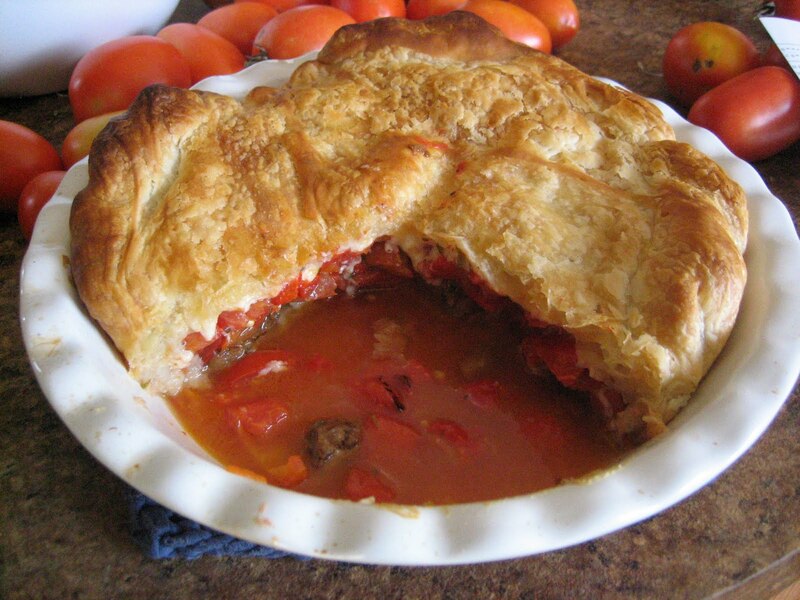 Add salt and oregano to taste and let cool.Wash and dry tomatoes and basil leaves. 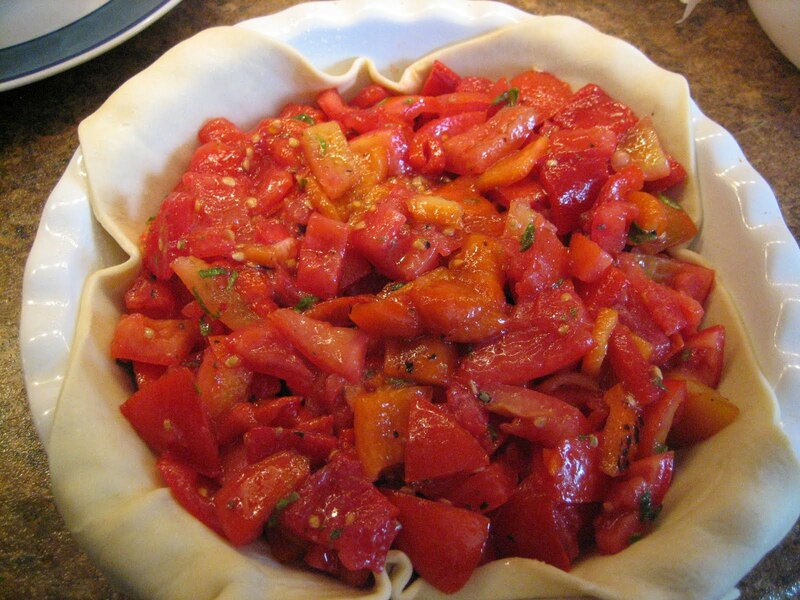 Cut tomatoes in half, remove the inner part and cut into small pieces. 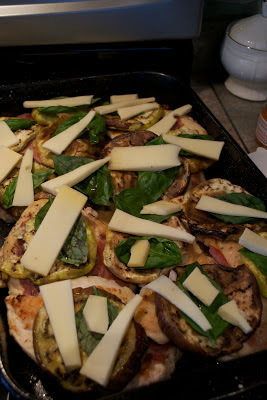 Cut basil leaves into small pieces and caciocavallo cheese into sticks. Put tomatoes and basil in a bowl, add salt and olive oil to taste and stir. Spread one roll of puff pastry over the baking tin and spread the eggplants on top of it and press with a back of a spoon. Pout the tomatoes with basil onto the eggplants and press again with a back of a spoon. Spread with caciocavallo sticks and place the remaining pastry sheet on top. Fold the edge of the pastry and press it. Riddle the surface using a fork. Bake in the preheated oven at 395°F for 30 minutes about or until golden brown. Let cool and remove from tin. Serve. Growing up in Winnipeg, I have fond memories of spending time at my Baba and Zeida's house. They lived less than 10 minutes away. I'd have sleepovers and Baba would always make me cream of wheat, a half a grapefruit (sliced in half, with each piece of fruit cut away from the skin) and a perfectly soft-boiled egg. She'd make sure that she picked up some corned beef and rye bread, my favourite, before my arrival. My Zeida would barbecue chicken, often drumettes. I believed that they came from chickens with really small legs, but never questioned the practice since they tasted so good. I'd scope out the garden for ripe cucumbers. My brother and I would pick apples from the trees in the backyard,while my Baba lost her mind thinking that we were going to fall and hurt ourselves. Before family dinner started, I'd steal all of the homemade pickles my Baba had cut up and put on the table. No surprise that some of my most vivid memories are about the food. I can't help but feel a little bit envious of friends (with babies) who have family living in the same city as them. Living in Ottawa, R and I have at least a 5 hour drive to see Giz and a 5 hour flight to see his parents in Saskatchewan. Will E know her grandparents, aunts, uncles, cousins, etc? When will she understand why I stick this noise-making black thing (iPad) in front of her face for Skype dates? Will we ever find a babysitter with whom we can feel comfortable leaving E? We were really happy to have R's parents come for a visit last week. 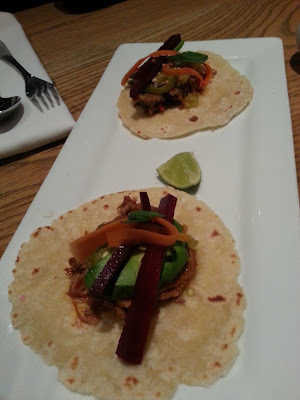 They spent a lot of time with E. R and I even got a night out, which we took advantage of by going out with a couple of friends to Sidedoor Contemporary Kitchen and Bar, located in the Byward Market. They serve small plates, which we shared with a couple of friends. My favourite dish was the tacos. 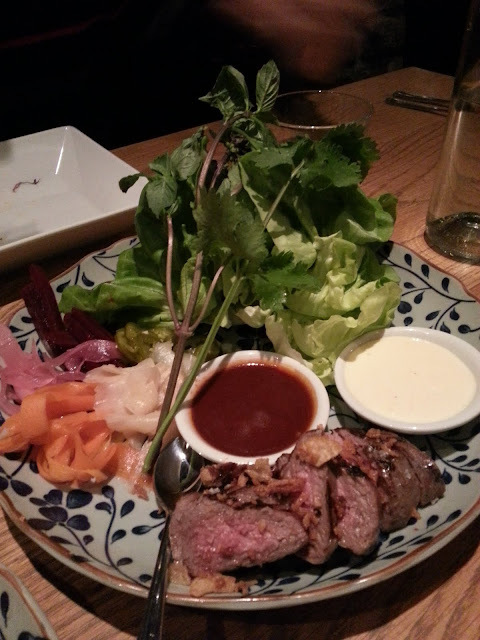 We ordered lamb with funky chili and Chinkiang pulled pork. The combination of flavours in the lamb was so good. It had both my friend and I wishing we could mix flavours that well. While R was driving around looking for parking in the market (usually a frustrating experience), I was texting my friend asking for his recommendations on what to order. He suggested the broiled blackened cod with butter leaf lettuce wrap and house pickles. Since I'm not a big fan of cod, I decided to try the grilled beef version. Everyone enjoyed this dish. My only critique would be that they could have had more of the house pickles and basil on the plate. We were left with a lot of lettuce and meat. 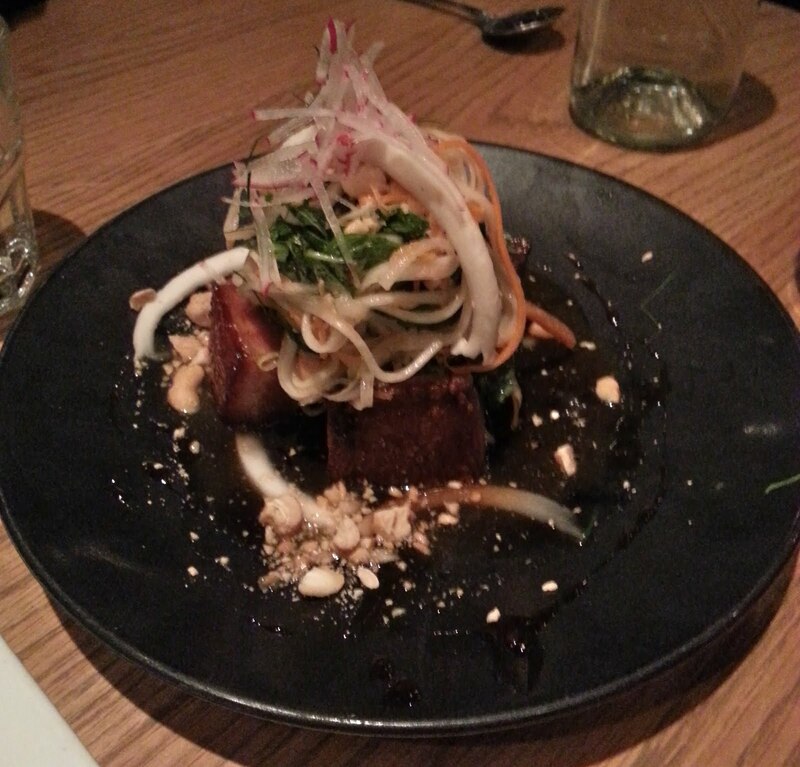 This is the pork belly braised in a master stock with mango salad, cashews and chili lime caramel. 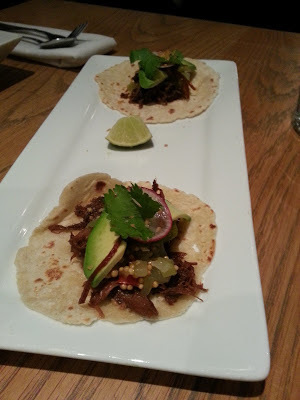 This was probably my second favourite dish, after the tacos. The pork belly was nice and tender, but the best part was the salad topping. So delicious. I enjoyed the calamari. It was lightly battered and fried. Good flavour and texture. 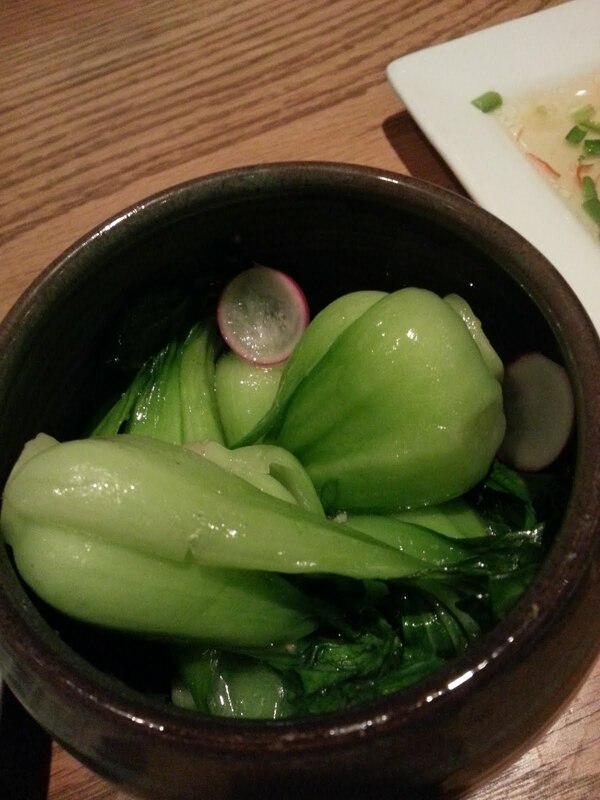 I don't eat much bok choy and it tasted fine to me. 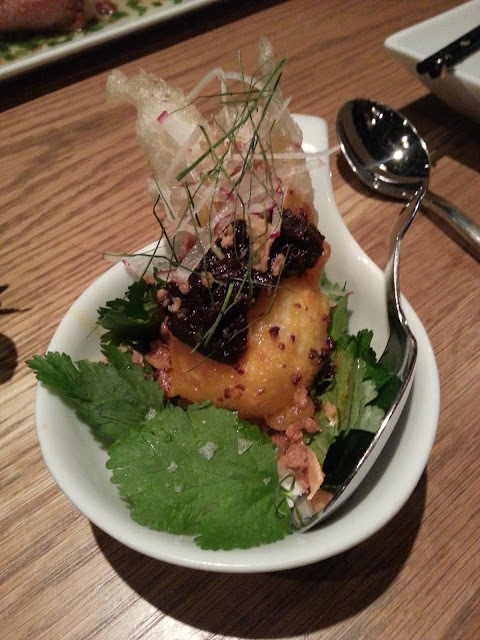 The son-in-law egg with chili jam and fried shallots was, visually, quite interesting. But none of us actually liked the taste. The combination of egg (with a soft yolk) and chili jam is not a flavour combination I find pleasing. 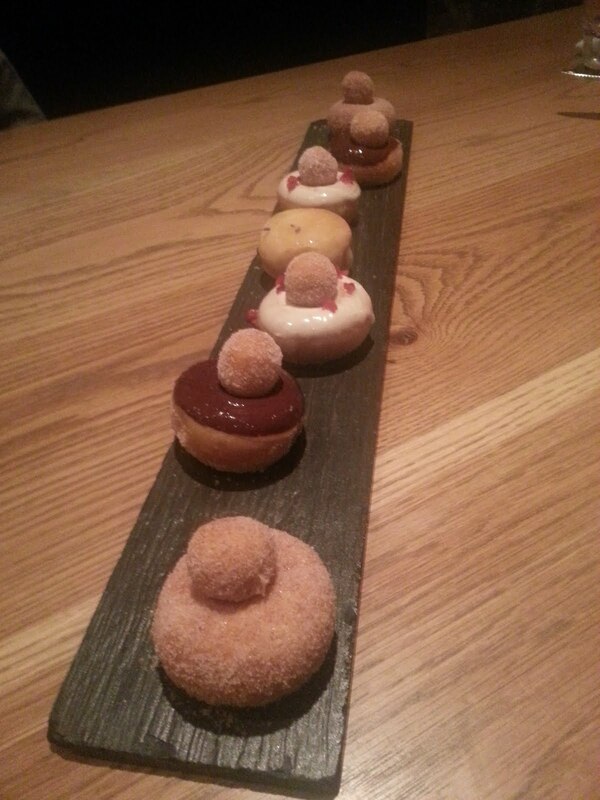 For dessert, we ordered the donut sharing platter. However, shortly before it arrived, one of the people at the table visited the washroom. So, the three of us sat staring at the donuts, waiting for our friend to return. Finally, the waiter noticed and came over to tell us that we shouldn't wait because they are warm. But, by the time we ate the donuts, they weren't warm anymore. So, maybe they're great when they're fresh out of the oven. But if you let them sit for 10 minutes, they're nothing special. So, all in all, an enjoyable meal. But, I would say that there was some imbalances in the dishes. Some were amazing and some were underwhelming. Now, in terms of the service...I read a lot of reviews ahead of time that gave negative feedback about the service. Our waiter was well-informed. But, his demeanour was a bit "too cool for school." Not a deterrent to returning, but I could see how a customer would feel uncomfortable.